Larry is a Luddite - someone who resists technological and other forms of change. His official title is director of marketing for Acme Manufacturing. He steadfastly refuses to take content marketing seriously. 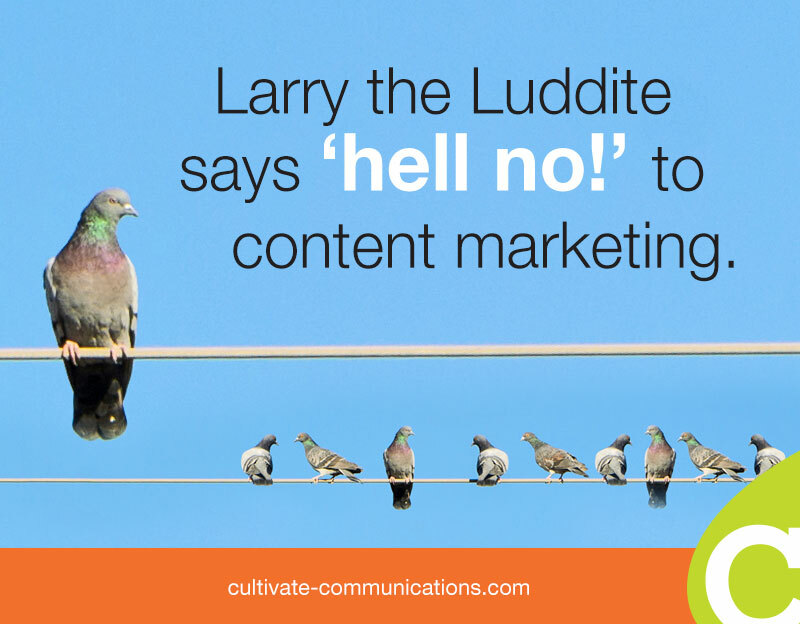 Larry recently read an article that says companies today must adopt a “content-focused approach to meeting the needs of their customers.” This new approach is definitely interesting but he doesn't see the value in it. Content marketing looks like just another fad to him. He's decided he'll just wait it out, much like he's done with dozens of other business and marketing practices over the years. Besides, it looks like there's a lot to learn and who has time for that? Larry is busy producing product sheets, ads, brochures and other traditional collateral. He also manages vendors who help him with trade shows, search engine optimization and keep the Acme website up-to-date. Larry doesn't believe customers have fundamentally changed. He thinks that's a load of crap, and says Acme's existing customers are like him - traditional buyers who have always done things the same way. They take comfort keeping things uniform and efficient. About a year ago, one of Acme's salespeople tried to make the point that a new approach is needed. “Customers have fundamentally changed," he said. "They want to do their own research. What they need now is education, not to be sold.” Nobody listened, especially not Larry. But that problem solved itself. This forward-thinking salesperson left in frustration to take a different job. Problem solved. But what if Larry is wrong? Larry represents the business owners and marketing managers who are convinced that business as usual continues to be effective. But what if they're wrong? A growing body of research suggests that they are. The average purchase decision is 57% complete, and more than 10 information sources have been consulted by the time customers engage with suppliers, according to research conducted by CEB Marketing. In addition, the higher the purchase complexity, the later customers engage suppliers. Almost 70% of buyers have increased the amount of content used to research and evaluate their purchases, according to Demandbase. Its research also showed that 75% of B2B buyers say the quality of the winning vendor’s content was an important factor in their purchase decisions. Content marketing seeks to inform and educate prospects, rather than interrupting them with endless ads and offers. The most successful content marketers conduct research to deeply understand the needs and motivations of their prospective customers, develop content that addresses those needs, and consistently publish it. which can lead to increased sales and other desirable outcomes. Savvy companies are now enabling prospects by assembling collections of content and resources that are based on the needs of their ideal buyers. In a sense, the content becomes a surrogate salesperson, helping to nurture prospects through their buying process to the point of sale. What are YOU doing to develop content that attracts potential buyers? If you want more information about a new model of engaging prospects and driving sales, (we call Growth Cycle Marketing), please click here.